It hasn’t been a particularly harsh winter here in New Jersey. I suppose it never is when you grow up in Wisconsin. 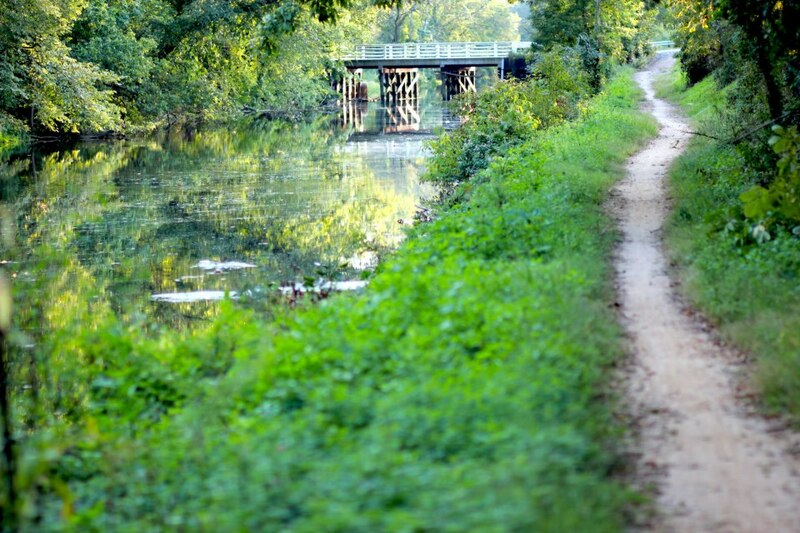 I hadn’t been out to one of my sacred spaces—the Delaware Raritan Canal path—much since Hurricane Sandy passed through these parts in October. When my husband and I walked the canal path on New Year’s Day, I kept thinking of a friend of ours who took a walk with his toddler through the streets the morning after the storm. When his son asked what had happened to the trees and if someone was going to fix them, he didn’t have the heart to tell him that the uprooted trees, the cracked bows, and the bare stumps were now a permanent part of the scenery, and that trees are breakable, fragile, and mortal, just like you and me. 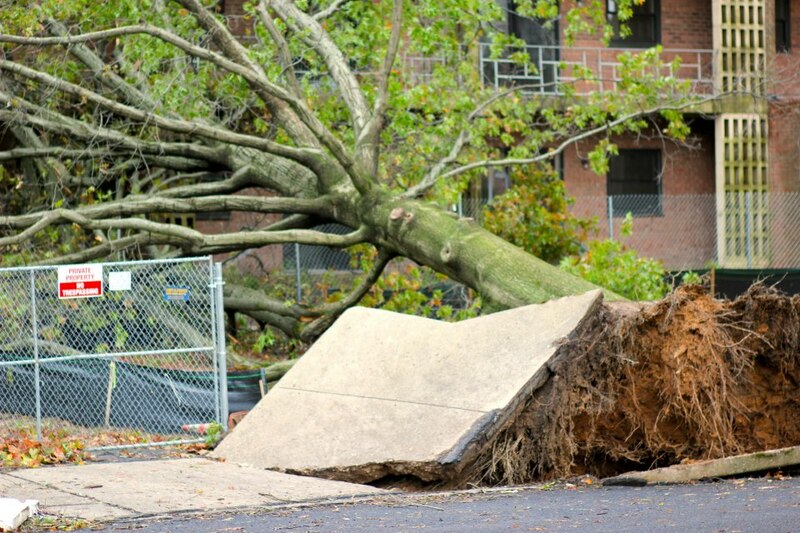 Some local damage after Sandy. All photos by Evan Schneider. As I run on these slightly colder days down the path and my eye takes in these changes to the scenery, I think of how hard it is for we as humans to accept such destruction, and what kind of fear it drives into our hearts. Suddenly as we look at the world around us, we feel everything’s brittle, nothing is for certain. The bare insides of great trees are marked by great scars, and some of the loftiest, burliest ones plummeted in the storm. If we can hardly trust that the same tree bows that framed these lovely paths won’t crumble above us, in what can we trust? Is there no permanence on this earth? 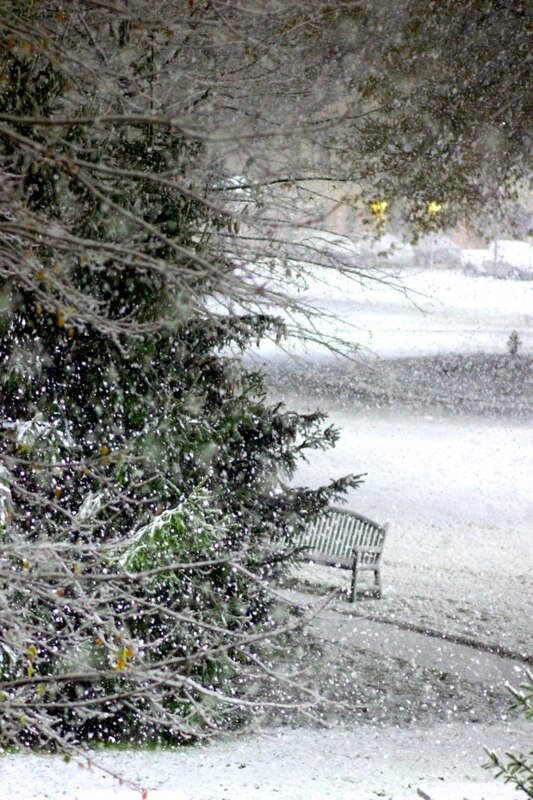 Snow in Princeton, NJ this winter. My generation’s experience of such vulnerability is marked not only by storms (we’ve seen some of the greatest destruction done by tsunamis and earthquakes in our time), but also a terrorist attack on our own soil. Shortly after 9/11, I read an essay by Rabbi Arthur Waskow in which he preached the scary truth that what the attacks taught is that not even the steel towers we stretch to the sky can protect us from destruction, heartache, and pain. There are only wispy walls and leaky roofs between us. The planet is in fact one interwoven web of life. The command to love my neighbor as I do myself is not an admonition to be nice: it is a statement of truth like the law of gravity. However much and in whatever way I love my neighbor, that will turn out to be the way I love myself. If I pour contempt upon my neighbor, hatred will recoil upon me. When my husband and I walked that path on the first day of a new year, I grimaced at the branches laid bare and broken around us. He remarked that animals and insects had found new homes in their fallen limbs and crevices. Yesterday when I ran along the canal waters, the geese jubilantly honked at me and took to flight, their bulbous, awkward bodies somehow capable of both buoyancy and soaring into the skies. Later a bluebird fluttered alongside me and took shelter in one of the tattered trees. 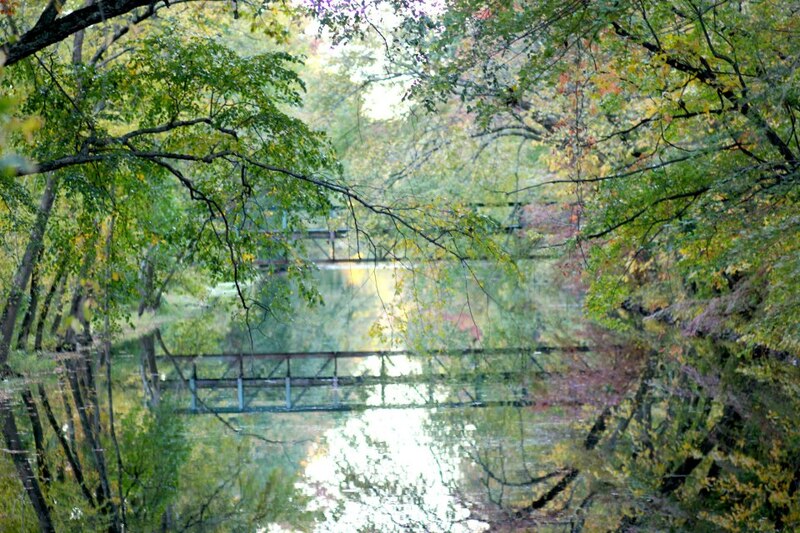 Fall on the D&R Canal, Princeton, NJ. Life buzzes amidst the changed landscape with an audacious, oblivious vigor. Where we see scars and imperfections, animals and insects make their homes. Death will eventually give birth to new life, and yet, how we remove ourselves from this interdependence! How we seek to believe that if we just build bigger, better towers, stronger, sleeker fortresses, we can insulate ourselves from the pain, the destruction–the humanity of it all! When we let fear drive how we live, we seal ourselves off from one another, from the fragility, yet also the incredible resilience of interconnectedness. We forget that the lessons from nature, the way she rebuilds with the scarred timber, the tattered landscape something even more beautiful, are demonstrative of the fact that we need one another more than we know. Summer on the D&R Canal. What if we accepted the fact that we can’t do anything to protect ourselves from storms and began to worship vulnerability rather than permanence? What if we found salvation in the new life springing from brokenness and accepted brokenness as our common bond? What if we found our strength in a God who offers us not permanence or immortality or insulation, but deep vulnerability, interconnection, and communion? Despite the title, I don’t have anything groundbreaking to say this morning, except that fellowship breaks into the most unlikely of places, and that yesterday was a reminder of all the possibility that exists not just in thinking but in listening. Downtown Nanning. Crowds watch the dancers in the square. All photos by Evan Schneider. I had my first meeting with my new language partner. It had been difficult for me to commit to finding someone to chat with in this language that means so much to me–it felt like replacing all the amazing people I’d met in one place, and the choice needed to be just right. But I didn’t have the time for that or the money, and so I chocked this one up to the universe, letting the university arrange the placement for me. And yesterday a woman who’s about five years ahead of me in life greeted me by the coffee bar with the abrupt, halting speech patterns only reminiscent of a Chinese speaker of English, and as she began to unload copious amounts of unsolicited advice despite what little she knew of me, something in my spirit leapt and my heart warmed. 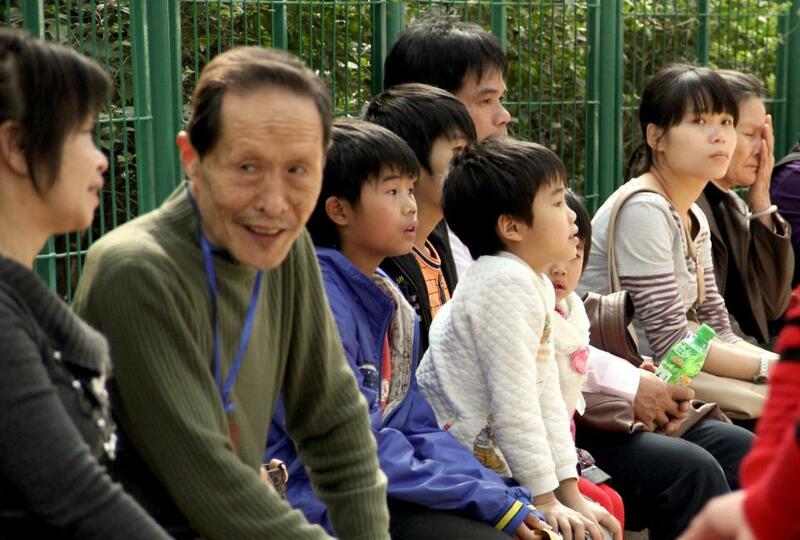 See, I may have mentioned that there’s a love language in China to do with giving advice–giving advice shows you care, and so people take and give as much as is humanly possible! And as my new language partner and I settled so effortlessly into a pattern of her speaking English and me speaking Mandarin, each pausing to correct unfamiliar words, I think not only my ears, but my heart recognized something as familiar and began to open. 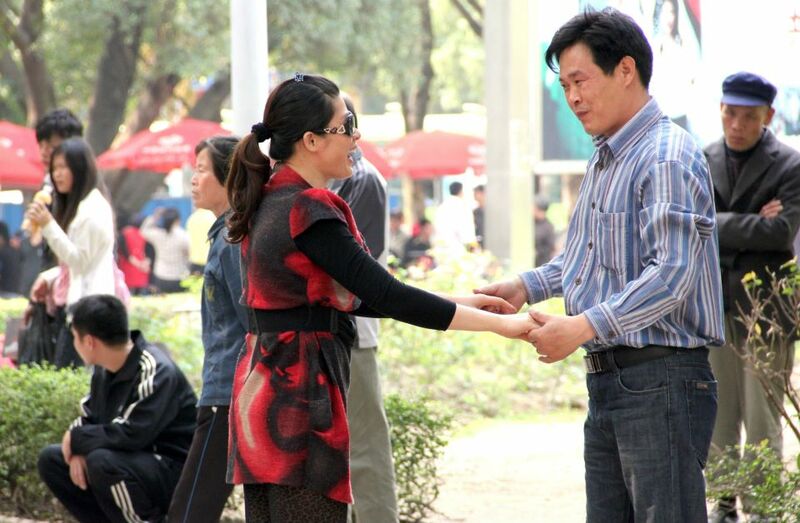 A couple dancing in the square. 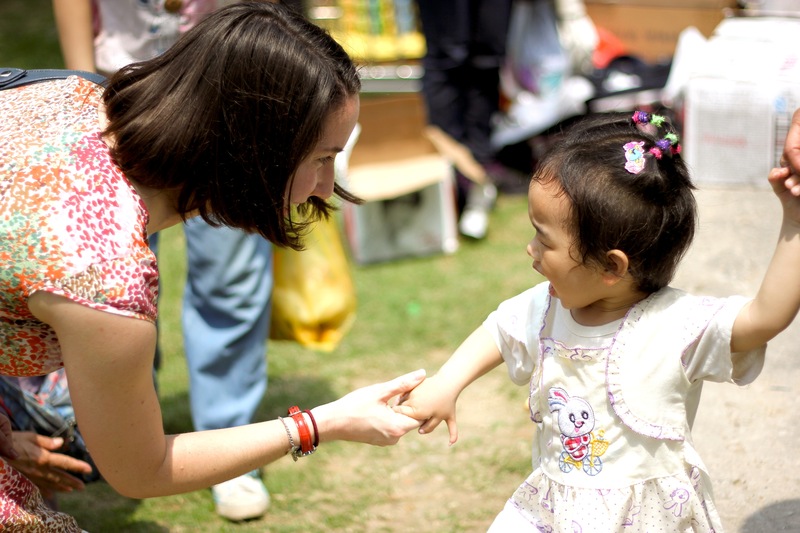 As my language partner so openly told me about her struggles with depression in this country, her indecision about having a second child, and the pressures of work and family, I had to marvel as the intimacy that simply being present for one another, speaking the same language, introduces. I suppose because language-learning is essentially about vulnerability, being willing to stumble as you’re trying to express some of the deepest parts of you, it’s also about faith, as you surrender your dignity, and putter along like a child. 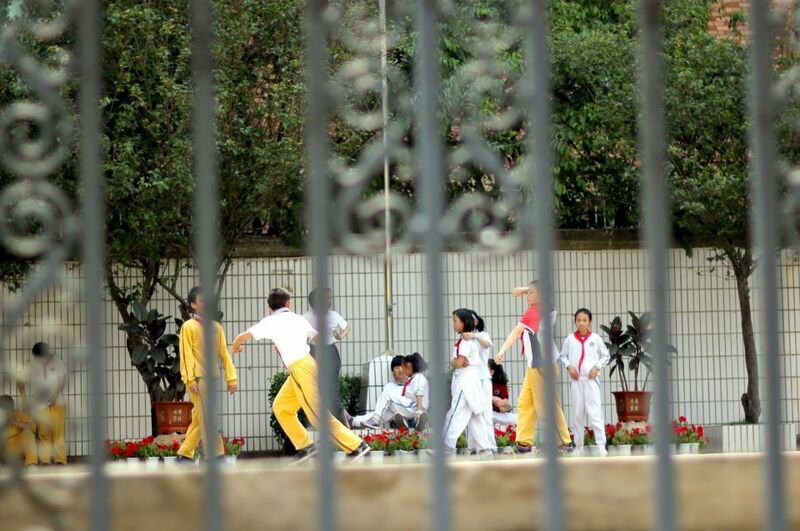 Children playing outside a school in Yunnan, Kunming. So letting go, relearning, and listening. That’s what God’s got on my heart this morning…what about you? 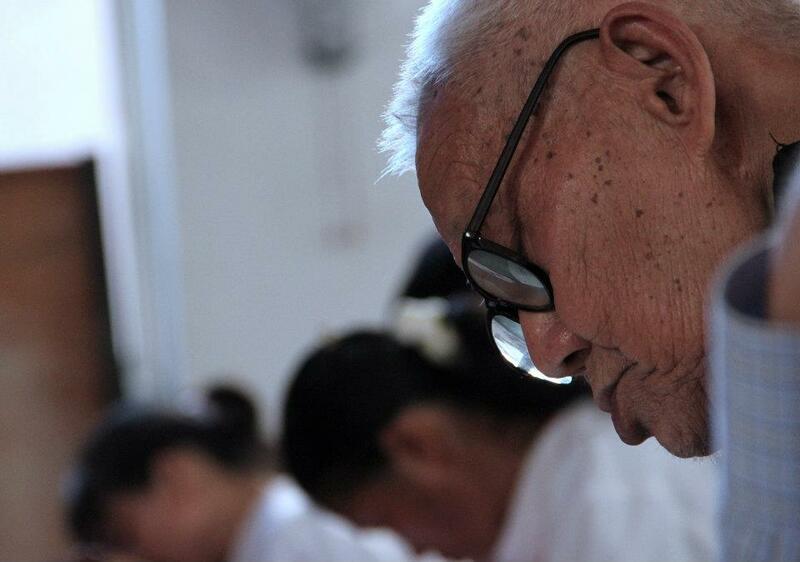 When we first arrived in China, many of my posts took the form of earnest prayers that God provide security to us in this unknown place. I struggled to trust God’s faithfulness when our apartment flooded, when the visa process loomed large and complicated, or when my dissertation research just seemed too impossible to complete. And I’m thankful for a community of supportive readers who hear me out when I fear and when I complain, and the process of writing through these feelings and the fears has been immensely important and meaningful to me. 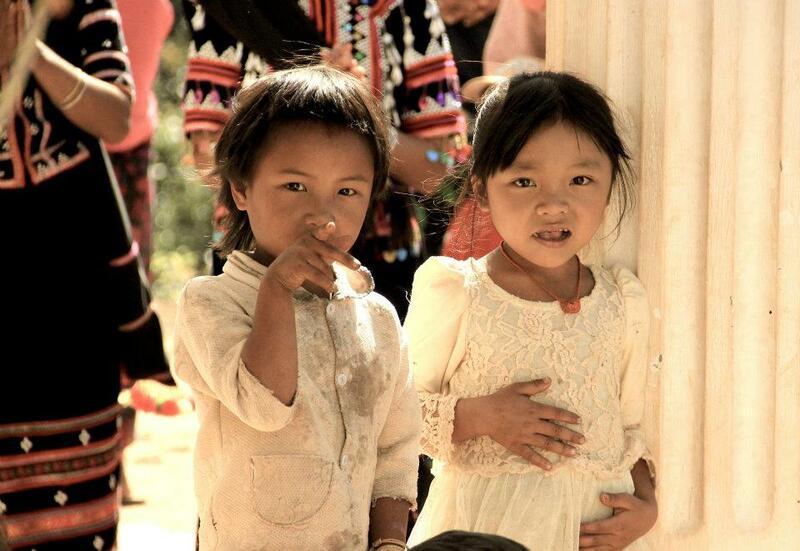 Lahu children in the mountains of Yunnan province. But it’s nothing compared to what many in the world face everyday. When I listened to This American Life‘s radio show on Americans in China, when I visit with my foster families who are struggling to make ends meet, and when I remember that despite China’s growing wealth, half of the population lives on a dollar a day, I am reminded that we in America, for the most part, are on the side of the rich and powerful. Even I, as a graduate student, am rich by most Chinese standards. 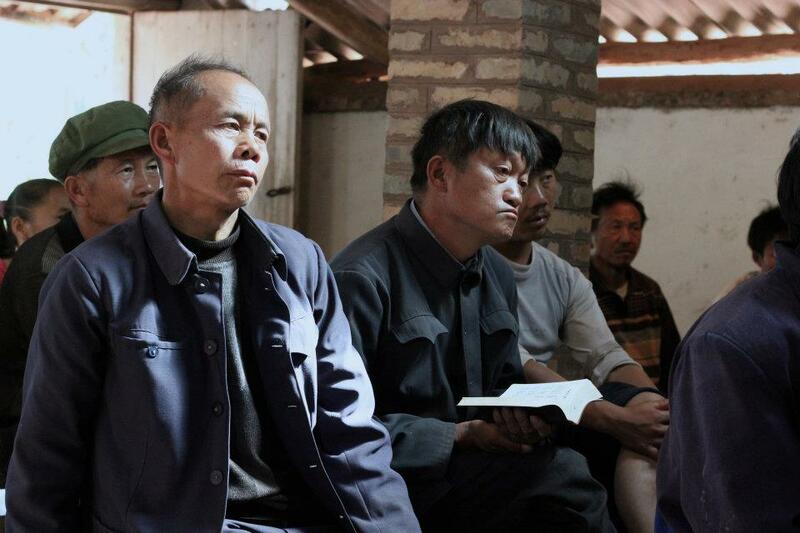 Chinese men in a church in Yunnan province. This whole partnership and solidarity thing is tricky. And rather than a drastic move across the world or an elaborate ministry to the poor, I think any effort at solidarity or partnership with others first requires us to admit how powerfully our own wealth distracts us from the Gospel and hampers our ministry, and based on this realization, agree to play a minor, humble part that is based on listening, rather than a major one in doing God’s work. 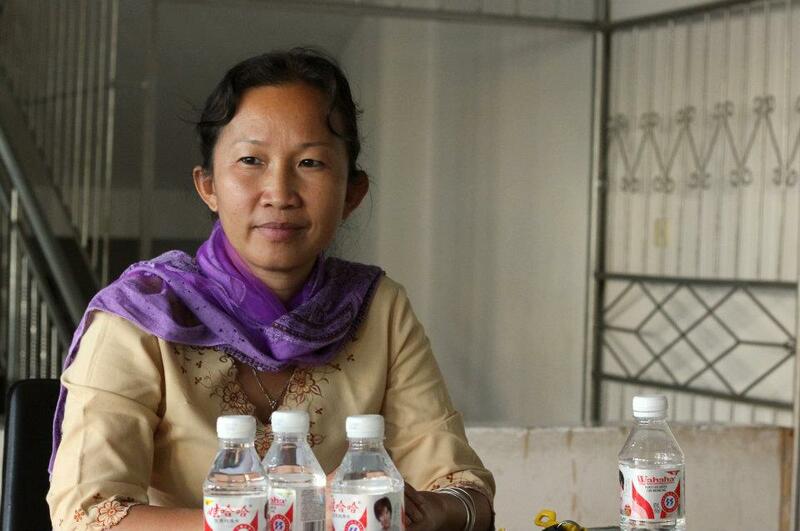 A young female minister in the church in Yunnan. It seems we’re quite incapable of welcoming Christ because we’re so stuffed full of ourselves. The real thing we have to let go of is our self. We aren’t really free until we’re free from ourselves. It’s a process–we can’t look the three demons in the eye: the need to be successful, the need to be righteous or religious, and the need to have power and get everything under control (174), until we recognize that material wealth has its limits and has taken its toll on our ability to know God and others. And it is that toll, that ego, those demons, that hamper our ministry and our ability to know and understand others. The author with a foster child. But that’s the beauty of this challenge to be vulnerable with one another, to craft a life built on the promise of abundance, sacred things, and mutuality. As Rohr writes, “But Jesus doesn’t offer us any certainties; he offers us a journey of faith. Jesus doesn’t give us many answers; he tells us what the right questions are, what questions the human soul has to wrestle with to onto Christ and the truth. Our formulations determine what we’re really looking for. Our questions determine what we ultimately find and discover. Answers acquire power too quickly; they often turn our words into ammunition to be used against others. And answers make trust unnecessary, they make listening dispensable, they make relations with others superfluous. Having my answers, I don’t need you in order to take my journey. I need only my head, my certainties, and my conclusions. It’s all private. But Jesus said we have to live in this world so as to be dependent on one another. The real meaning of a poor life is a life of radical dependency, so I can’t arrange my life in such a way that I don’t need you. We can’t do it alone. And isn’t that the bare bones of solidarity and partnership–that we can’t do it alone? That dependence on others requires us to rearrange our lives around one another, however inconvenient, humbling, and excruciating that process may be? I have a confession– I don’t think I’m there yet. 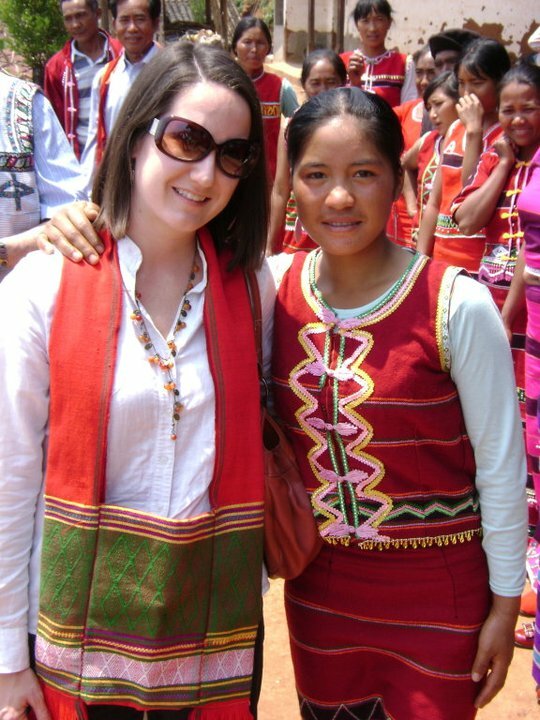 Me and a Wa woman in Yunnan, 2011. All photos by Evan Schneider. But I desire to grow in Christ, and I pray that I am growing, not just with every year spent here in China, or every realization of the Gospel as seen through the eyes of my brothers and sisters here or in America, but in the quietness of my heart, where I admit that my wealth and my power have led me astray, where I find the willingness to ask questions and really listen, rather than rely on my own answers, and where I discover that I am my own worst enemy, that my needs for recognition, power, and control pale in comparison to the a life of dependence on Jesus and my neighbors. And perhaps most importantly, I’m realizing that it’s not so much about me and my rising above all this, but about the faults and the wounds that I carry, in which others may recognize their own humanity, and we might begin to tear down these walls that divide us.